Teresa Thompson will be finishing up her Doctor of Nursing Practice (DNP) program this August 2016. She has been a model of health promotion and wellness, committed to fitness training, and excited to use her knowledge to help her future patients. In 2014 the Laramie Boomerang ran a story on Thompson, who placed second in the Wyoming Open Professional Division, a fitness competition in Cheyenne. Thompson took up fitness training originally to lose weight, but came across some unexpected benefits. She found herself increasing in confidence and mental and physical health as she embraced her new passion. "I plan to pursue Family Practice, as I hope to help a wide spectrum of patients, young to old. In this realm I will be able to pursue health promotion, which entails proper nutrition and adequate physical activity." Thompson continued, "Once I get stable in my practice, I do have interest in pursuing continued education in the area of weight loss and nutrition, because it is an area that many patients (myself included) struggle to find success. I already have a great base of knowledge because of my own interest and dedication to fitness, training, and nutrition. One great perk of my job will be seeing people succeed with their health in areas such as weight loss and improved well-being." "Yes, 100%. I, through the process of training, experience many up's and down's. It is not an easy road and the path to success is not always chronological or linear. There are setbacks, good days, bad days, weeks at a time without seeing improvement in weight loads or times. But I keep at it, I trust the process, and I will never quit." "I think this experience will provide me the ability to empathize with my patients who are struggling to find the path to success. My own struggles have proven that success is not stagnate, one must always work for improvement, whether its working towards improvement or maintaining something achieved. It is a continuous process, as is a patient's health." 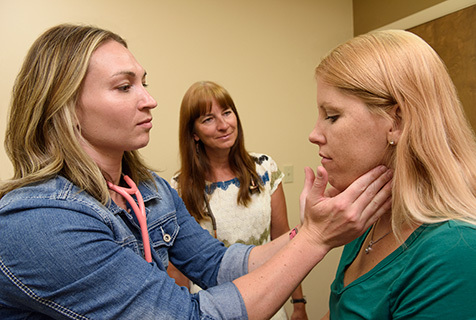 UW's innovative DNP program includes a Health Behavior Change course, the content of which should come in handy for Thompson in her intended work with her future patients. With her experience and training, there are some very fortunate people who there who will benefit from Thompson's skills and attained wisdom. Best wishes to this upcoming new practitioner! Below: Teresa Thompson (left) works in the Family Care Clinic with preceptor Jill Leinen, MSN, APRN-C (center).